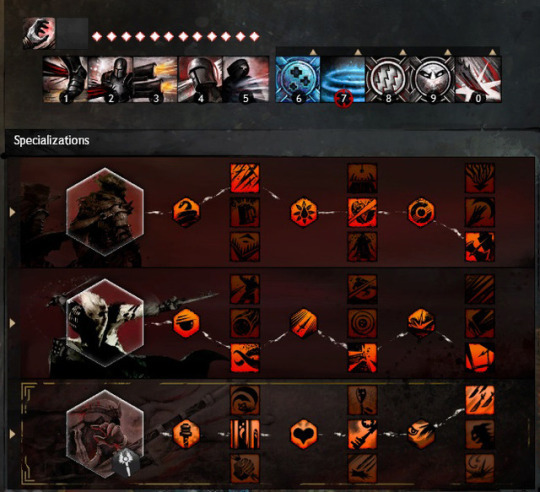 Build theme: A build that steals health as you attack. Build details: This build revolves around making critical hits and stealing health from opponents as well as creating immobilze and inflicting conditions (which also help to steal life). First off, the basics. 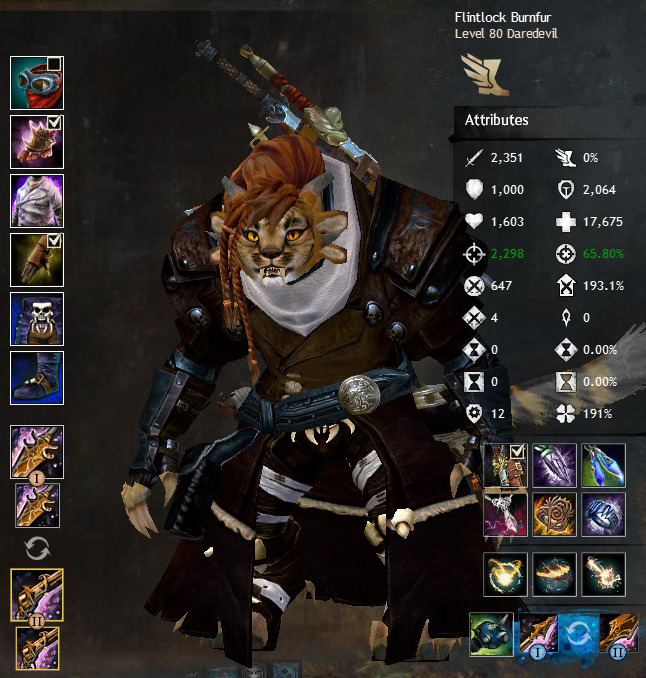 This is Flintlock Burnfur's build. Her main weapons are dual pistols, but she can swap out to dual daggers in a pinch if there’s a need for it. Let’s take a look at the skills first. There’s the usual skills for pistols and daggers, but the skills that help make the build are her utilities. First up is the healing signet, which as a passive heals you as you attack. In a pinch when activated, it’ll provide over 3,000 points of healing. Next up, is the shadow refuge, which altogether is great when you need a quick stealth. Two more signets, Signet of Agility and Signet of Shadows. Agility grants higher perception as a passive, but when activated it refills endurance and clears conditions from nearby allies. The Shadows grants a 25% increase to speed as a passive and when activated it applies conditions to nearby targets. Last but certainly not least is Impact Strike, which is a nice interrupt, followed up an upper cut that sends the target flying and a Finishing Blow that deals a good chunk of damage. Flintlock’s running Deadly Arts, Critical Strikes and Daredevil. Flintlock is running Marauder’s gear, which gives pluses to Power, Precision, Vitality and Ferocity. The vitality is purely to beef up her hit points. For armour runes, six runs of vampirism, which gives pluses to power and steals tons of health with attacks, when using a heal skill or when below 25%. Her weapons are also Marauder’s, but with Sigil’s of Fire and Blood. Both are a 50% chance on a critical hit to firstly cause an AOE fire and Steal health. So lots of life steal in this set up. Currently, all of Flintlock’s weapons (including underwater) are all ascended, aquabreather is ascended, and all trinkets and backpack is ascended. I’m fairly confident whenever Flintlock gets into a fight, as she can even do quite well against champions. Especially dodging around them and firing continuously at them. Critical hits come at a pretty good rate, and health steals are common, so she’s always regenerating health when she’s attacking. One can go overboard, however, and if surrounded, there’s a good chance it can get over her head.